The Walking Dead added more drama, some new characters, and a ton of walkers as the show returned for its fourth season this past Sunday with “30 Days Without an Accident.” While I was disappointed in the second half of the third season, and didn’t feel the finale was exciting as it could have been, this season seems to have gotten off to a good start. I was reminded more of how the show felt during the first season where there was a good mix of drama and action. I like that we have finally moved on from the core group looking for a place to stay. Some time has passed since the events of the last season and a quasi-normal life has been set up at the prison. They have a farm with some animals and gardens, the kids go to school, and everyone seems to be adjusting to their new lifestyle. 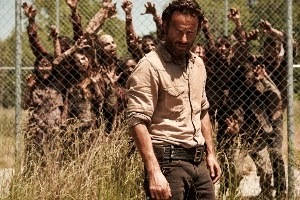 It wouldn’t be so bad if it weren’t for the hordes of walkers bashing themselves against the fence that surrounds the prison grounds. The survivors are literally imprisoned as their only means of survival. Mere existence is precarious in this world. 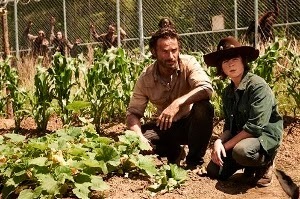 We are immediately reminded of that when Rick (Andrew Lincoln) and Carl (Chandler Riggs) discover one of their pigs is suffering from a mysterious illness. They don’t seem to think much of it, but it’s a definite red flag for the viewer. But we don’t get much of a chance to think about it because the prison doesn’t have everything and supplies must be obtained. A group led by Daryl (Norman Reedus) and Tyreese (Chad L. Coleman) head off to former civilization to see what they can find. Daryl has become somewhat of a celebrity among the former Woodbury residents. They apparently admire his survival skills and they aren’t afraid to let him know it. Though Daryl has warmed up to people since the early days of the zombie apocalypse, he still seems a bit stand-offish about open displays of affection. This provided some humorous moments as Daryl attempted to banter with his new comrades. But humor doesn’t last long on The Walking Dead and laughter soon turned to terror as it became apparent the department store they were raiding had a rooftop full of walkers. In one the best zombie sequences in a long time, the group finds themselves underneath a horde of walkers falling through the ceiling. It’s been a while since we’ve had some old-fashioned flesh-eating zombie action, but we get it here. I thought they might go for a major death in first episode, but it turned out they only lost one of the newcomers. And as Beth (Emily Kinney) points out, it’s just not worth shedding tears over anyone anymore. By far the most compelling element about this episode is the mysterious illness. Remember the sick pig? Rick encounters another one while he’s out hunting in the woods. He also encounters a very unusual survivor who already looks like a walker but isn’t. The woman is a reminder that Rick still needs to be aware people can’t always be trusted despite his rediscovered sense of humanity. But back to the sick pigs, because that’s what they kept trying to distract us from. The question still lingers: what is wrong with these pigs? This episode doesn’t provide an answer, but we do know this mysterious illness is not isolated to pigs. The final scene indicates their peaceful prison life is going to be short-lived, and I’m looking forward to seeing what’s going to happen next. One more note – if you’re wondering about the Governor (David Morrissey), he hasn’t been forgotten. 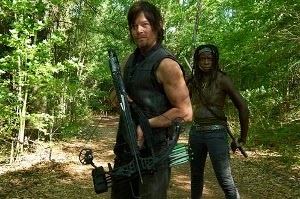 Michonne (Danai Gurira) apparently spends a lot of her time away from the prison hunting for him. She hasn’t found him yet, but I’m sure he’ll turn up eventually.